Antimicrobial drug resistance occurs when bacteria undergo certain modifications to eliminate the effectiveness of drugs, chemicals or other agents designed to cure infections. To date, the burden of resistance has still remained one of the most major clinical concerns as it renders prolonged and complicated treatments thereby increasing the medical costs with lengthier hospital stays. Of complex causes for bacterial resistance, there has been increasing evidence which proved the significant role of efflux pumps in antibiotic resistance. Coadministration of efflux pump inhibitors (EPIs) with antibiotics has been considered one of the promising ways not only to improve the efficacy but also to extend the clinical utility of existing antibiotics. This presentation begins with outlining current knowledge about bacterial efflux pumps and drug designs applied in identification of their modulating compounds. Following, the application of in silico approaches in search of novel and potent Staphylococcus aureus NorA efflux pump inhibitors were presented. Acknowledgements: This research is funded by Vietnam National Foundation for Science and Technology Development (NAFOSTED) under grant number 106-YS.05-2015.31 to Khac-Minh Thai and 108.05-2017.12 to Minh-Tri Le. Dr Khac-Minh Thai graduated in Pharmacy in 2000 from the University of Medicine and Pharmacy at Ho Chi Minh City, Vietnam and earned the Master’s degree in Pharmacy in 2004 with Prof. Hyun-Ju Park from College of Pharmacy, Sungkyunkwan University, Korea. He got his PhD degree in 2008 under the guidance of Prof. Dr. Gerhard F. Ecker at Department of Medicinal Chemistry, University of Vienna, Austria. Currently, Dr Thai serves as Associate Professor at Department of Medicinal Chemistry, Faculty of Pharmacy, University of Medicine and Pharmacy at Ho Chi Minh City, Vietnam. He was a visiting professor at University of Franche-Comté (UFC), Medical and Pharmaceutical Sciences, Besanson, France on Apr-May 2016. His researching work in recent years is application of pharmacoinformatics including both ligand-based approach and structure-based approaches to provide the in silico models for classification and prediction of toxicological and bioactive compounds. 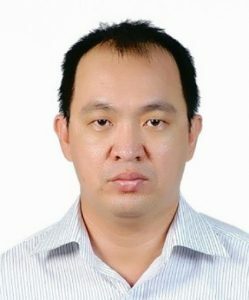 He is a member of the Editorial Board of BioMed Research International, MedPharmRes and published 25 peer-reviewed papers, 3 book chapters, 53 vietnamese articles, >40 conference contributions and 9 invited lectures.